My daughter is in child care through the week while I’m at my shiny new job. One day per week, my parents take A and she gets to spend the day with them. I love that she gets a special day with her grandparents, and that they get to develop a strong relationship with her. On Grandparent Day this week, they took her to the mall to see Santa. Now, A is pretty shy around strangers, especially those that want to pick her up. Most of the time, she’ll cry. I was a bit apprehensive about how this would play out, because putting her on the knee of a stranger seemed like a recipe for waterworks. They took A to the mall in the afternoon, with a tummy full of lunch & having had a good morning nap. They waited in line for a half an hour, and pointed out to me afterwards that despite other kids in line who were crying, A stayed calm and in a good mood. Finally, she got her turn with The Big Guy. 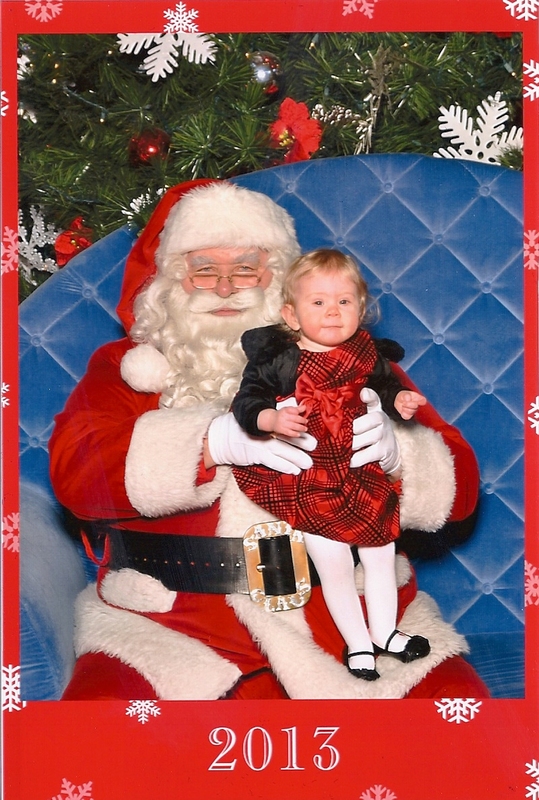 Santa must really have a way with the wee ones, because not only did she not cry, she seems pretty happy in her photo. I was half-expecting to get one of those red-faced, tear-streaked sorts of Santa photos. You know, the ones that everyone gets a good chuckle out of, in later years. Nope, as far as Santa photos go, A’s is great! This entry was posted in Family life, Uncategorized and tagged baby's first Christmas, Christmas, Family, Santa Claus on December 14, 2013 by lovelaughlaundry.